The previous owner of this vintage photograph described it as featuring four US soldiers/cooks on KP (kitchen police) duty. I have my own interpretation of the photograph and perhaps you have your own view which I hope you will share. I believe that the young men are from a military base due to their clothing and their choice of having a backdrop which included a tank. If they are soldiers, they are clearly on leave. The fact that one man is wearing a white apron and another man is wearing a white jacket indicates that their military duties may include working in a kitchen. However, there is also a possibility that the afore mentioned white clothing and the two hats seen in the photo are just studio props. Note that two of the men are holding cigarettes while being photographed. Whatever the story really is, this is a terrific image that captures the aura of friendship between these young men. The photographer’s embossed logo is difficult to read but it is decipherable that his name was Thompson and his studio was located somewhere in New York City. A Spanish American War era soldier poses for his portrait at an unknown studio in an unknown place. Note the US pin and crossed rifles pin on each side of his collar. He also has pins on the front of his hat indicating he was a member of the 5th regiment, company E. The 5th Infantry Regiment was nicknamed the ‘”Bobcats” and is the third-oldest infantry regiment of the U.S. Army. It was established in 1808. The regiment arrived in the Philippines too late to participate in the war but did perform occupation duties and later saw action in the Philippines War of 1900. The photograph has an inscription on the reverse that identifies the soldier as “Henry”. It is not clear whether “Henry” is this young man’s first or last name. Other background information about this image was likely lost when a previous owner trimmed the photograph to fit it into a frame. Hopefully, a visitor to the cabinet card gallery can confirm that this is indeed a Spanish American War era soldier and not a World War I era soldier. 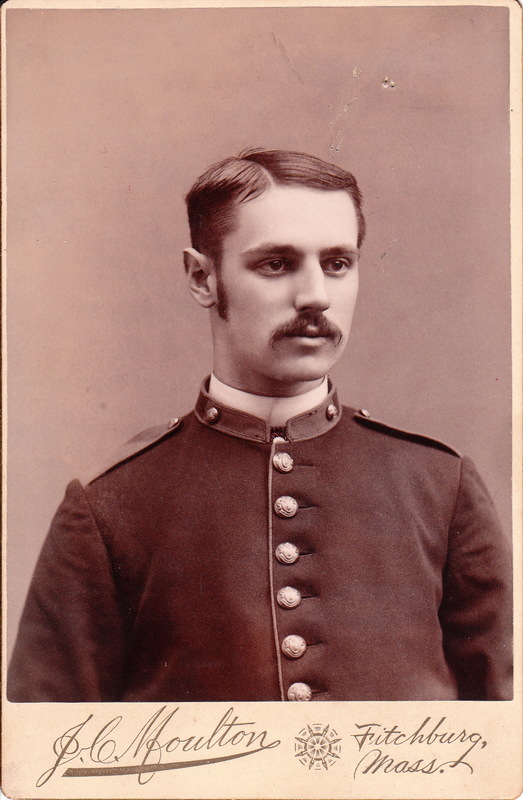 A clean cut young man poses for his portrait while wearing his dress military uniform. He is either in the military or he is a cadet in a military school. Perhaps a visitor to the site can make the final determination. The photographer of this cabinet card is J. C. Moulton of 368 Main Street, in Fitchburg, Massachusetts. Joseph Carr Moulton (1824-1914) was born in Sandwich, Mass. to farming parents. He was a descendant of the famous Revolutionary War officer, General Moulton. He left home at 21 and went to Newton, Mass. where he worked in a machine shop. The job didn’t suit him, so he began working as a photographer. He arrived in Fitchburg in 1848, and one of his studios was located at 159 Main Street (1876-1900). Moulton was involved in many aspects of Fitchburg’s community life. He was the superintendent of his church’s sunday school, he was a Mason, and he was the first President of the local YMCA. 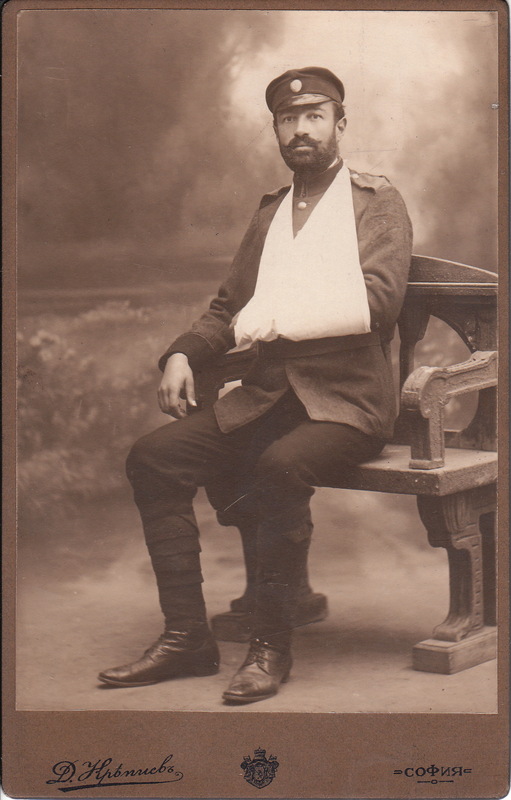 This photograph is a portrait of a wounded non commissioned Bulgarian military officer. The preceding description of this gentleman is not confirmed information. It is also unknown, due to translation limitations, what the name of the photographer is and in what country and city the studio was located in. Hopefully, someone from cabinet card gallery’s vast unpaid research department , will leave a comment providing additional information about the subject of this photograph. This Cabinet Card captures four Spanish American War era soldiers posing for their portrait in the studio of Vestine, located in Rockford, Illinois. The men are reading a magazine together and apparently find something amusing. Note the men’s military hats and overcoats. To view other photographs by Vestine, click on the category “Photographer: Vestine”. 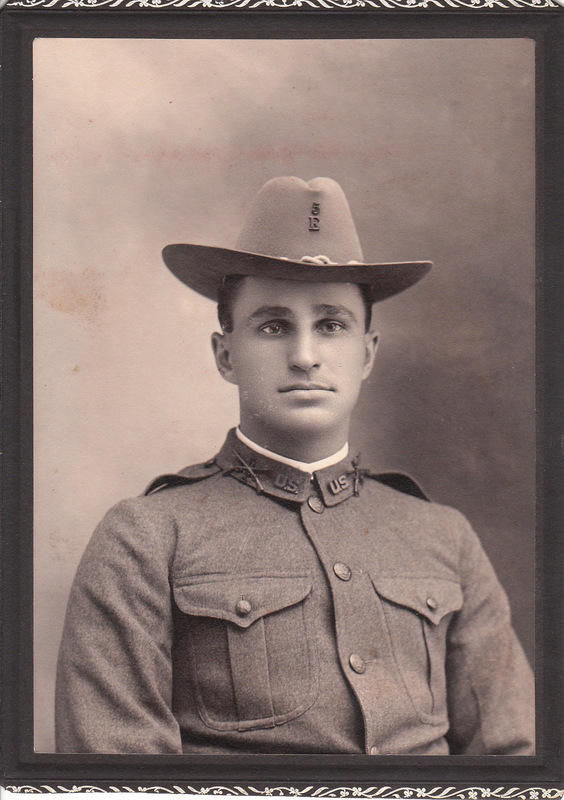 Cabinet Card photograph of a handsome US military man. Do the three stripes mean he is a sergeant? The image is very clear and the photographer was Blanchard of Los Angeles, California. This Cabinet Card subject is a military sharpshooter photographed by Heath of Bangor, Maine. The soldier is wearing medals including one that names him as a sharpshooter. The other medals include one representing Sons of Union Veterans. He also appears to be wearing Medical Maltese Crosses on his collar. Any information from readers of this blog about the type of medals this soldier is wearing, would be greatly appreciated. Three enlisted men from the World War I Russian Army are pictured in this Cabinet card. The reverse of the card indicates that the photograph was taken in 1916 by the “Photo Studio of Y. S. Ivanchenko”. What exactly may have been on these soldiers minds. In 1916 Russia, the Russian war effort was characterized by shortages, poor command, death, and desertion. The citizens were facing starvatio, inflation and a refugee problem. Soldiers and civilians blamed the incompetence of the Tsar and the government. By the end of the year Rasputin was killed and the Tsar was warned that the army would not support him in event of revolution.